Is Coffee A Rosacea Trigger? 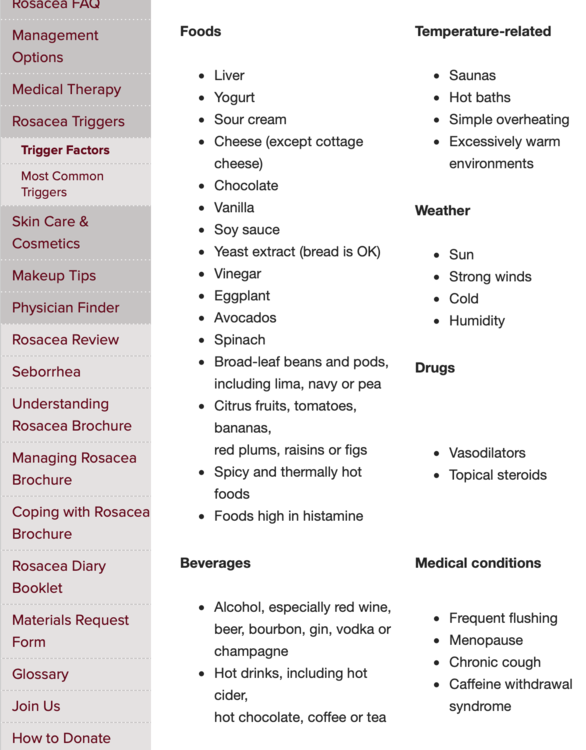 First off just remember that whenever you hear about rosacea triggers that usually the list of triggers haven't been substantiated in any clinical studies and most of the triggers are simply anecdotal reports. However, one trigger has been substantiated that should be removed from the list and this trigger is coffee. It is not a rosacea trigger and coffee lovers can rejoice. There is a difference between a rosacea flareup trigger and a flushing trigger. To understand the difference read this article. There is evidence that coffee is a flushing trigger. Rosacea LTD IV has a page, Your Red Face May be Caused by Caffeine Intoxication. What are the Side Effects of Caffeine?, verywell, By Elizabeth Hartney, PhD states, "Flushed Face -- a red face at work might make you look embarrassed, and can be embarrassing!" Oral thermal-induced flushing in erythematotelangiectatic rosacea. Wilkin JK; J Invest Dermatol. 1981 Jan;76(1):15-8. The effects of caffeine and coffee, agents widely alleged to provoke flushing in patients with erythematotelangiectatic rosacea, were investigated. Neither caffeine nor coffee at 22 degrees C led to flushing reactions. Both coffee at 60 degrees C and water at 60 degrees C led to flushing reactions with similar temporal characteristics and of similar intensities. It is concluded that the active agent causing flushing in coffee at 60 degrees C is heat, not caffeine. JAMA Dermatol. 2018 Oct 17. doi: 10.1001/jamadermatol.2018.3301. Association of Caffeine Intake and Caffeinated Coffee Consumption With Risk of Incident Rosacea In Women. Li S, Chen ML, Drucker AM, Cho E2,5,6, Geng H, Qureshi AA, Li WQ. This is also a myth based on a poorly designed study, and it is a common for someone to skim the study and come to a false conclusion. There WAS an increase in the MTCI (malar temperature circulation index) of the cold-caffeine/caffeine pill administered group(s). That's a number indicating the difference in baseline temperature of your skin vs. the temperature after the studied element was introduced. For reference, redness was seen at MTCI of 1.4 or higher. MTCI ranged from 0.8 bare minimum to 2.2 for the average high values. Since 0.8 was the bare minimum seen, all agents had an effect, even the caffeine. These are low doses of caffeine -- a single cup of coffee is 90-120 mg, and the researchers stopped at 200 mg when administering caffeine pills. The caffeine did have an effect on increased blood flow to the cheeks at this dose. In fact, the MCTI was 0.8 to 1.1 in the caffeine treated participants, where 1.4 is the flushing threshold (per the researchers.) Naturally, if 200 mg brought the skin that close to flushing they ought to have tried 300 to 400 mg, which would have likely brought the MCTI to 1.6 to 2.2 -- very visible flushing. However, they did not try any higher doses, so we can not draw a conclusion. What the study actually found is that in a tiny sample of 24 people, a 200 mg caffeine pill did increase malar skin temperature towards the flush point, but didn't cause visible flushing at a 200 mg dose. It also found that in some of the cohort, hot water alone caused a reaction just as bad as caffeine alone! More specifically, the 200 mg caffeine pill group saw MTCI of 0.8 to 1.1. Cold coffee was nearly identical. The hot water people saw 1.1 to 3.6 MTCI. So, in some of the participants, the caffeine pill WAS exactly as bad as hot water. The worst reaction was, of course, the group administered caffeine + hot water. The dose of caffeine used is very important, because the average daily caffeine intake among caffeine drinkers is much higher. Per Villanova University, "More than half of all American adults consume more 300 milligrams (mg) of caffeine every day, making it by far America's most popular drug." So, essentially, we know caffeine has an effect, and at 200 mg, it's slightly lower than what would cause visible redness. It stands to reason that doubling the caffeine would cause a more pronounced effect, but the authors did not bother to try this obvious test of their hypothesis. 24 people is a tiny sample. Caffeine allergy is uncommon, and a 24 person cohort would easily miss these people. For example, my mother, from a single cup of black coffee, becomes dizzy and violently ill. That'd be a classic example of caffeine intolerance. No such people were part of the study. If you had a 24 person study, you'd miss all sorts of genetic anomalies. You wouldn't even find a person with common peanut allergy in a group that small due to the indicience of same, so this study is only worth the fact that heat is a contributor to flushing. It does not tell us that caffeine is not. Hot drinks, and hot herbal teas without caffeine have absolutely no effect on my flushing. However, even a half cup of COLD white tea, or a single sip of yerba mate, or COLD green tea sends me into an immediate reaction within 30 minutes, followed by a 12 hour period of facial itching and very hot cheeks. Every single time. Caffeine reaction is very real. I know of two popular rosacea bloggers who accidentally removed caffeine from their diet (say, because of stomach upset) and had all flushing symptoms resolve after years of playing around with other factors and medications that had no effect. Thanks Vestpocket for your post on this subject and pointing out how tiny the population of only 24 people in the study was. Wouldn't it be a novel idea for a group of rosaceans to get together and fund their own research. For example, let's get 10,000 rosacea sufferers together in a non profit organization dedicated to find the cure for rosacea and each rosacean donates $1 to this non profit organization that funds a rosacea double blind, placebo controlled, clinical study on a rosacea trigger, such as coffee, or for that matter, whatever the 10,000 rosacea sufferers deemed to be a rosacea clinical subject worth investigating. Certainly one of the RRDi MAC members might be interested in receiving $10,000 to conduct such a clinical study that rosaceans would like to fund rather than the current status quo studies being done now by the other non profit rosacea organizations. As mentioned in the original post, there is a difference between a flushing trigger and a rosacea flareup trigger. When you drink coffee (or for that matter ingest caffeine from green tea or whatever) after you flush, and eventually recover from the flush, does the flush exacerbate your rosacea seriously, or after the flush subsides, is your rosacea unchanged? "Increased caffeine intake from coffee was inversely associated with the risk of incident rosacea. Our findings do not support limiting caffeine intake as a means to prevent rosacea. Further studies are required to explain the mechanisms of action of these associations, to replicate our findings in other populations, and to explore the relationship of caffeine with different rosacea subtypes." See end note 3 in the original post of this thread for the source.